The defendant consents to being served. The plaintiff serves the defendant personally (hands the defendant appropriate documents) while the defendant is physically present in Alabama. Usually this is done by a trained process server. 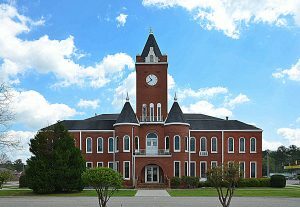 Showing to the court that the defendant has minimum contacts with Alabama such that it’s “not inconsistent” with the Alabama or U.S. Constitutions to allow the action to proceed. This third method – minimum contacts – is often called “long-arm jurisdiction,” for obvious reasons. If you think it sounds like a really fuzzy definition, you’re right. If you think that fuzziness is bad, you’re wrong. The imprecision of the language allows courts and judges to interpret it as they perceive fairness dictates, and generally they do a pretty good job. The case we’re studying here is an example of the court’s seeming to get it right. The wife in Logarides v Logarides, Case No. 2160332 (Ala. Civ. App. April 28, 2017 filed for divorce in Alabama even though the husband lived in Virginia. He did not object to the divorce (subject matter jurisdiction over the marriage existed just because the wife lived in Alabama) but argued that the court lacked personal jurisdiction over him and therefore could not order him to pay child support or medical expenses for the couple’s children. Both parties submitted affidavits. The husband’s stated that he lived in Virginia and had “no meaningful contact” with Alabama. The wife’s stated that the parties were married in Alabama, that the wife had lived in Alabama while the parties were married and the husband was stationed overseas, that the children were born in Alabama, and that the husband had opened bank accounts in Alabama. She also showed that the husband had shown an Alabama address on at least one joint tax return and on various banking documents. The trial court denied the husband’s motion to dismiss and, after findings of fact, ordered the husband to pay temporary child support and medical expenses for the children. The husband filed a petition for writ of mandamus seeking to have the appeals court order the trial court to dismiss the wife’s claim for support. The husband had relied on Burke v. Burke, 816 So.2d 498 (Ala. Civ. App. 2001), in which the appeals court had permitted subject matter jurisdiction over the marriage but not personal jurisdiction over the defendant. The appeals court distinguished Burke, however, because the Burke defendant asserted without contradiction by the plaintiff that she “resides in the State of Florida, that she has never resided in the State of Alabama, that she does not transact business in the State of Alabama, and that she has not visited the State of Alabama.” 816 So.2d at 501. Here, in contrast, the plaintiff alleged those various contacts the defendant had with Alabama, and the defendant did not refute them in any meaningful way. The appeals court therefore denied the defendant’s petition. Next Next post: Is the Farm a Marital Asset?